This island together with the rest of the kitchen is all ready to be fitted next month. The modern design is a mix of American Black Walnut, gloss white and stainless. 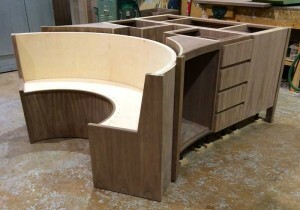 The banquet will be upholstered in leather and has a Eclipsia Bianca granite top and circular table. Designed by CP, made by Rozen Furniture for their client.